His Holiness Jagadguru Shankaracharya Shri Chandrashekarendra Saraswati Swamigal or the Sage of Kanchi was an Indian Saint. 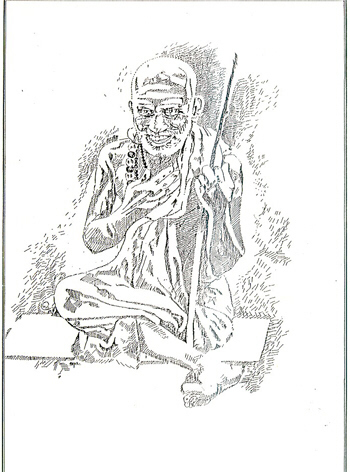 He is usually referred to as Nadamadum Deivam (The walking God), Sage of Kanchi, Maha Periyaval or Paramacharya. Swaminatahn (Purvashram name of His Holiness) was born on 20 May 1894, under Anuradha star according to the Hindu calendar, into a Kannadiga Smartha family in Viluppuram, South Arcot District, Tamil Nadu. He was the second son of Subramaniya Sastrigal, a District Education Officer. The child was named Swaminathan, after the family deity, Lord Swaminatha of Swamimalai, near Kumbakonam. Swaminathan began his early education at the Arcot American Mission High School at Tindivanam, where his father was working. He was an exceptional student and excelled in several subjects. He won a prize for his proficiency in the recitation of the "Holy Bible". In 1905, his parents performed his Upanayanam, a Vedic ceremony which qualifies a Brahmin boy to begin his Vedic studies under an accomplished teacher. During the childhood of the Acharya, his father consulted an astrologer who, upon studying the boy's horoscope, is said to have been so stunned that he prostrated himself before the boy exclaiming that "One day the whole world will fall at his feet." In 1906, the 66th Acharya of Sri Kanchi Kamakoti Peetham performed the annual Chaturmasyam (a forty-day annual ritual performed by Hindu ascetics while remaining in one place), in a village near Tindivanam in Tamil Nadu. This was Swaminathan’s first exposure to the Math and its Acharya. Later, Swaminathan accompanied his father whenever he visited the Math where the Acharya was deeply impressed by the young boy. I had a bath at the Kumara Koshta Tirtha. A carriage of the Math had come there from Kalavai with the people to buy articles for the Maha Puja on the tenth day of the passing of the previous 66th Acharya. One of them, a hereditary maistry (mason) of the Math, asked me to accompany him. A separate cart was engaged for the rest of the family to follow me. During the journey the maistry hinted to me that I might not return home and that the rest of my life might be spent in the Math itself. At first I thought that my elder cousin having become the Head of the Math, it was his wish that I should live with him. But the maistry gradually clarified matters as the cart rolled on. The acharya had fever which developed into delirium and that was why I was being separated from the family to be taken to Kalavai... I was stunned by this unexpected turn of events. I lay in a kneeling posture in the cart, shocked as I was, repeating "Rama... Rama," the only prayer I knew. My mother and other children came some time later only to find that instead of her mission of consoling her sister, she herself was placed in the state of having to be consoled. The 67th Acharya also died, after reigning for a brief seven days as the head of the Math. Swaminathan was immediately installed as the 68th head of the Kanchi Kamakoti Peetam on February 13, 1907, the second day of the Tamil month of Masi, Prabhava year. He was given Sanyasa Asramam at the early age of 13 and was named Chandrasekharendra Saraswati. On May 9, 1907 his "Pattabishegam" as the 68th Peetathipathi of Kanchi Kamakoti Peetam was performed at the Kumbakonam Math. Devotees including Shivaji Maharaja of Tanjore, government officials and pundits participated in the event. Even though there was not enough property in the mutt to be administered, the court considering the benefit of the mutt, ordered the mutt to be administered under the “Guardian and Wards Act”. Sri C.H.Venkataramana Iyer, an illustrious personality from Kolinjivadi (Colinjivadi) village near Coimbatore was appointed as guardian by the court. The administration of the mutt was under guardianship from 1911 to May,1915. On the day of Sankara Jayanthi in the year 1915, Swamigal took over the administration of the mutt on the completion of his 21st year. The administration of the mutt was taken over in name, but the actual work was taken care of by an agent, one Sri Pasupathi Iyer. He was an able administrator who volunteered to do the job without compensation and hailed from Thirupathiripuliyur. Swamigal does not sign any document, instead Sri Mukham stamp is placed on documents. Jagadguru Sri Chandrashekarendra Saraswati spent several years in the study of the scriptures and dharma shastras and acquainted himself with his role as the Head of the Math. He soon gained the reverence and respect of the devotees and people around him. To millions of devotees he was simply "Periyava" — the revered one or Maha-Periyava. "Periyava" in Tamil means a great person, and conveys endearment, reverence, and devotion. "Mahaswami" and "Paramacharya" are his other well-known appellations. Jagadguru Sri Chandrashekarendra Saraswati was the head of the Mutt for eighty-seven years. During this period, the Sri Kanchi Kamakoti Pitam acquired new strength as an institution that propagated Śankara's teachings. The devotion, fervour, and intensity with which the Paramacharya practiced what Śankara had taught are considered to be unparalleled by his devotees. Throughout his life, the focus of his concern and activities was rejuvenating Veda adhyayana, the Dharma Sasthras, and the age-old tradition, which had suffered decline. "Veda rakshanam" was his very life breath, and he referred to this in most of his talks. Remaining active throughout his life, the sage of Kanchi twice undertook pilgrimages on foot from Rameshwaram in the far south of the Indian peninsula to Benares in the North. Providing support through Veda Patashalas (schools teaching Vedic lore) through the Veda Rakshana Nidhi which he founded and honouring Vedic scholars, he reinvigorated Vedic studies in India. He organised regular sabhas ('conferences') which included discussions on arts and culture — these led to a renewed interest in Vedic religion, Dharma sasthras, and the Sanskrit language. His long tenure as Pitadhipathi is considered by many to have been the Golden Era of the Kanchi Kamakoti Peetham. He attained samadhi on January 8, 1994 and was succeeded by H.H.Sri Jayendra Saraswati.